The Red Sox stink. This we know. They are 57-59, fourth place, the whole thing. Why they stink is not quite as clear. Cody Ross and David Ortiz are the only position players who have hit especially well, and no one (save, uh, Scott Achison) has pitched well. Does anybody know where Dustin Pedroia and Adrian Gonzalez left their power? How about Lester and Beckett's ability to get outs? This is not like last year, where a good team fell just short of the playoffs. This is a bad team that's sucking wind. The owners called the meeting for Boston's off-day in New York on July 27 after first baseman Adrian Gonzalez, texting on behalf of himself and some teammates, aired their dissatisfaction with Valentine for embarrassing starting pitcher Jon Lester by leaving him in to allow 11 runs during a July 22 start. It was the latest incident in a season's worth of bad relations bubbling between Red Sox players and Valentine. Dustin Pedroia gave Boston 7.8 B-Ref WAR last year. He's given them 2.2 to date in 2012. Adrian Gonzalez gave Boston a cool 6.7 wins last year, against only 2.6 this year. It's almost as though they're struggling independent of the manager but blaming him because they need an excuse and he's vulnerable. Passan also tells of a cellphone picture circulating around the team, where Pedroia is standing with his thumbs up next to a slumbering Valentine, with the caption "our manager contemplating his lineup at 3:30 p.m." Funny. But to that we say, the Red Sox should have known they'd have trouble when they brought in a manager who spent most of the past decade in another time zone. 3:30 p.m. in Boston is 4:30 a.m. in Tokyo. There's no reason to think that an MLB manager can do anything—coaching, tips—to help his players' on-field performance. These are professional athletes, not high schoolers. But, hell, let's allow for the possibility that Valentine can indirectly harm his team through his public conduct, in which case we'd ask: What did the disgruntled players expect? Valentine's always been the kind of manager most beloved in boom times and most resented during downswings. When the team's winning, he's charismatic; when it's losing, he's an attention-whore. If Boston wanted a different manager—someone who wasn't cranky and outspoken—they could have hired someone else or kept the last guy. 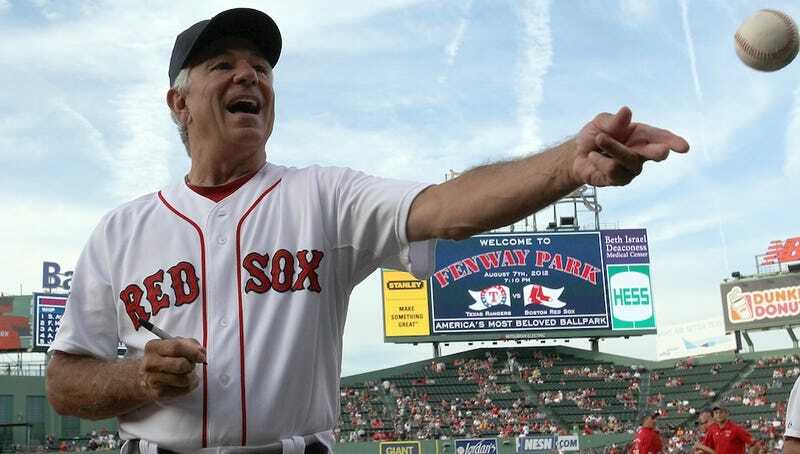 So far, Bobby Valentine has done nothing but remain Bobby Valentine. If Adrian Gonzalez, Dustin Pedroia, and the gang have a problem with that, they should, as we said last October, look toward the owners' box.